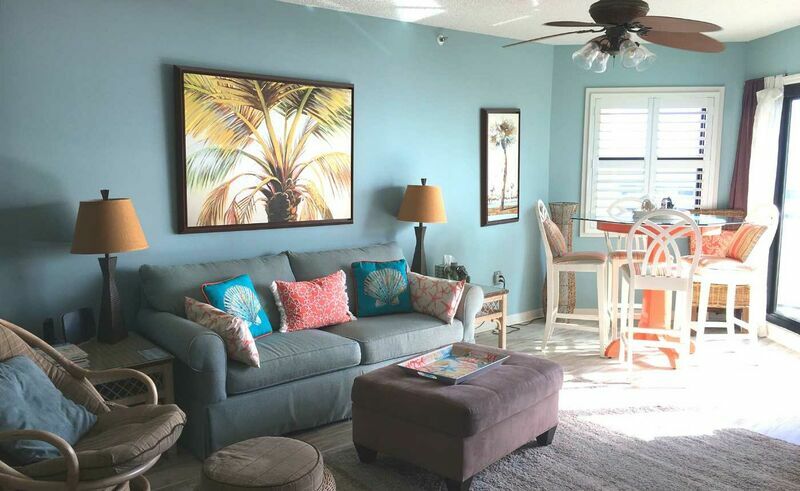 Oceanfront condo with 3 Bedrooms, 3 Baths with King* Queen/Single* Queen/Single, and baby crib. The oceanfront balcony offers panoramic view of the Atlantic coastline and beach. Elevator. Security gate and Keyless Entry. Inside amenities include new 60" flat HD tv in living area; wifi capable tvs in all bedrooms, including one that is a Smart TV. DVD, stereo. Wireless internet access. The fully equipped kitchen includes microwave, dishwasher and small appliances, toaster, blender and 2 coffeemakers (one Keurig, one drip). Wet bar. Washer/Dryer. The hall bathroom is Handicap friendly, (not ADA compliant) and the Master King ensuite has a Jacuzzi tub and new double marble top vanity. 'Nautical' light fixtures in all three baths, sliding 'barn' door on private bath of front BR, updated furniture in the bedrooms. Driftwood flooring throughout, All bed and bath linens are included. Max Occupancy: 8. Non-smoking. NO PETS NO LINENS PROVIDED FOR WINTER/MONTHLY RENTALS. This condominium has two pools, indoor and outside, hot tub, exclusive boat/fishing dock on Intracoastal Waterway with boat parking lot. Community grills and picnic tables. Outside shower and chair racks beside beach walkway. Indoor pool is heated Thanksgiving, Christmas, Easter holidays and every weekend in May at no extra charge.